Feel like a celeb on your big day with these A-list worthy gowns and accessories. 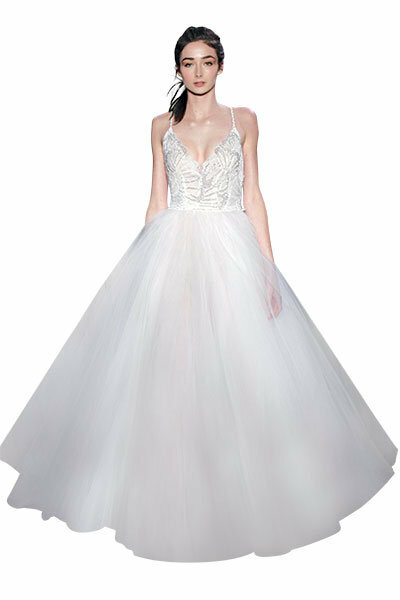 Sequin-embellished tulle ballgown by Jim Hjelm. Illusion-sleeve lace dress and tiara by Oleg Cassini Weddings at David’s Bridal. Crystal headband and sheath gown by Wonder by Jenny Packham for David’s Bridal. Crystal and pearl tiara by Andrew Prince. Crystal tiara headband by Betsey Johnson. Diamond necklace by Norman Silverman. White sapphire and pearl necklace by Simply Vera Vera Wang. White gold and diamond drop earrings by Gabriel & Co.
Floral pavé earrings by Mindy Weiss. Crystal pavé clutch by Nina. Pavé crystal sandal by Stuart Weitzman. Crystal embellished pump by Benjamin Adams London. Silk and lace slip by Journelle Collection. Ralph Lauren Romance Eau de Parfum. Smith & Cult Nailed Lacquer in Teen Cage Riot. JinSoon nail polish in Sahara. Hard Candy Fierce Effects Lipstick in Chalkin’ Pink. Revlon PhotoReady Eye Art dual eyeshadow. Melanie Mills Hollywood Gleam Body Radiance. Rouge Bunny Rouge Original Skin Blush in Habanera.